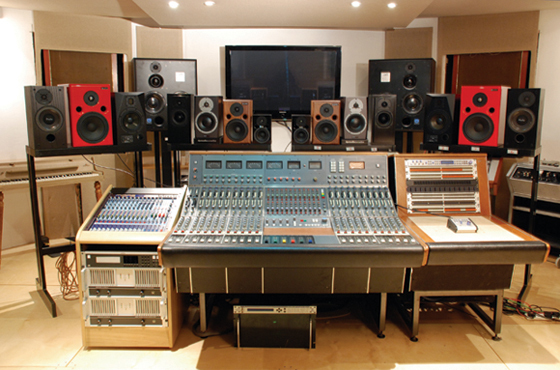 A nice selection of monitors at Funky JunkWe get a lot of questions about getting great sounding mixes at home. The number one problem for most users is not their DAW or their ears, but the monitor setup. If your monitors are not giving you a true representation of what is leaving your mix buss, then you need to fix it. Here are 5 common mistakes people make with monitors. Yep, if you are in a small room with large speakers, even worse a sub attached too, then there’s a high likelihood that you will have standing waves, frequencies that simply disappear or a room that turns into a huge port for the bass frequencies. Big speakers don’t equal big mixes, in fact a lot of the top mix engineers mix on nearfields. Mixing loud is going to create similar problems, as well as listening fatigue. Why not try remixing a couple of your problem tracks at half the volume you would normally use and then see what they sound like. You might be surprised. The common view on monitor loudness is 85dBs RMS. Your optimum monitor position should be, with speakers 1 metre from the wall and you one metre from the monitors - yep, that’s two metres back from the wall. Most home studios don’t even have that space - can you see the problem? If you have to compromise than get your monitors as far from the wall and the corners as you can, you should hear the bass decrease as you do it - which means that’s the bass missing from your mix that you thought was there. Speakers create energy, what you are trying to do is get as much of that energy firing towards you as possible. The front of the speaker acts as a baffle, also the sound travels down through the furniture. A set of Mopads or equivalent can make a heck of difference in helping to get the sound right. The position of your monitors can have a huge effect, both, as we’ve already shown with response, but also with stereo image. It is not always safe to assume that you can have them positioned vertically or horizontal - check with the manufacturer. You should ideally have the tweeters firing at your ears and an equal distance apart, if not then you may have stereo issues in your mixes. As you can see, all of these fixes cost either nothing, or save you money. Sometimes a problem doesn’t need money throwing at it, simply a little time and care.